We launched our Vulnerability Reward Program in 2010 because rewarding security researchers for their hard work benefits everyone. These financial rewards help make our services, and the web as a whole, safer and more secure. With an open approach, we’re able to consider a broad diversity of expertise for individual issues. We can also offer incentives for external researchers to work on challenging, time-consuming, projects that otherwise may not receive proper attention. Last January, we summarized these efforts in our first ever Security Reward Program ‘Year in Review’. Now, at the beginning of another new year, we wanted to look back at 2015 and again show our appreciation for researchers’ important contributions. Once again, researchers from around the world—Great Britain, Poland, Germany, Romania, Israel, Brazil, United States, China, Russia, India to name a few countries—participated our program. Here's an overview of the rewards they received and broader milestones for the program, as a whole. 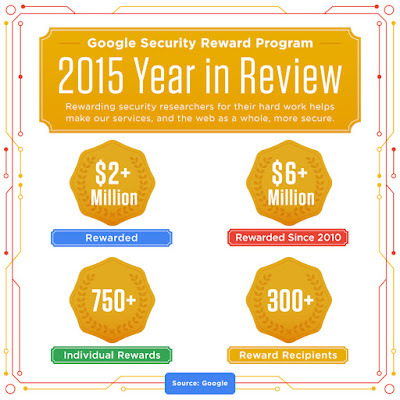 Android was a newcomer to the Security Reward program initiative in 2015 and it made a significant and immediate impact as soon as it joined the program. We launched our Android VRP in June, and by the end of 2015, we had paid more than $200,000 to researchers for their work, including our largest single payment of $37,500 to an Android security researcher. Last year, we began to provide researchers with Vulnerability Research Grants, lump sums of money that researchers receive before starting their investigations. The purpose of these grants is to ensure that researchers are rewarded for their hard work, even if they don’t find a vulnerability. We’ve already seen positive results from this program; here’s one example. Kamil Histamullin a researcher from Kasan, Russia received a VRP grant early last year. Shortly thereafter, he found an issue in YouTube Creator Studio which would have enabled anyone to delete any video from YouTube by simply changing a parameter from the URL. After the issue was reported, our teams quickly fixed it and the researcher was was rewarded $5,000 in addition to his initial research grant. Kamil detailed his findings on his personal blog in March. Tomasz Bojarski found 70 bugs on Google in 2015, and was our most prolific researcher of the year. He found a bug in our vulnerability submission form. You may have read about Sanmay Ved, a researcher from who was able to buy google.com for one minute on Google Domains. Our initial financial reward to Sanmay—$ 6,006.13—spelled-out Google, numerically (squint a little and you’ll see it!). We then doubled this amount when Sanmay donated his reward to charity. We also injected some new energy into these existing research programs and grants. In December, we announced that we'd be dedicating one million dollars specifically for security research related to Google Drive. We’re looking forward to continuing the Security Reward Program’s growth in 2016. Stay tuned for more exciting reward program changes throughout the year. Last August, we announced USENIX Enigma, a new conference intended to shine a light on great, thought-provoking research in security, privacy, and electronic crime. With Enigma beginning in just a few short weeks, I wanted to share a couple of the reasons I’m personally excited about this new conference. Enigma aims to bridge the divide that exists between experts working in academia, industry, and public service, explicitly bringing researchers from different sectors together to share their work. Our speakers include those spearheading the defense of digital rights (Electronic Frontier Foundation, Access Now), practitioners at a number of well known industry leaders (Akamai, Blackberry, Facebook, LinkedIn, Netflix, Twitter), and researchers from multiple universities in the U.S. and abroad. With the diverse session topics and organizations represented, I expect interesting—and perhaps spirited—coffee break and lunchtime discussions among the equally diverse list of conference attendees. Adrienne Porter Felt will talk about blending research and engineering to solve usable security problems. You’ll hear how Chrome’s usable security team runs user studies and experiments to motivate engineering and design decisions. Adrienne will share the challenges they’ve faced when trying to adapt existing usable security research to practice, and give insight into how they’ve achieved successes. Ben Hawkes will be speaking about Project Zero, a security research team dedicated to the mission of, “making 0day hard.” Ben will talk about why Project Zero exists, and some of the recent trends and technologies that make vulnerability discovery and exploitation fundamentally harder. Kostya Serebryany will be presenting a 3-pronged approach to securing C++ code based on his many years of experiencing wrangling complex, buggy software. Kostya will survey multiple dynamic sanitizing tools him and his team have made publicly available, review control-flow and data-flow guided fuzzing, and explain a method to harden your code in the presence of any bugs that remain. Elie Bursztein will go through key lessons the Gmail team learned over the past 11 years while protecting users from spam, phishing, malware, and web attacks. Illustrated with concrete numbers and examples from one of the largest email systems on the planet, attendees will gain insight into specific techniques and approaches useful in fighting abuse and securing their online services. In addition to raw content, my Program Co-Chair, David Brumley, and I have prioritized talk quality. Researchers dedicate months or years of their time to thinking about a problem and conducting the technical work of research, but a common criticism of technical conferences is that the actual presentation of that research seems like an afterthought. Rather than be a regurgitation of a research paper in slide format, a presentation is an opportunity for a researcher to explain the context and impact of their work in their own voice; a chance to inspire the audience to want to learn more or dig deeper. Taking inspiration from the TED conference, Enigma will have shorter presentations, and the program committee has worked with each speaker to help them craft the best version of their talk. Hope to see some of you at USENIX Enigma later this month!